Dave Stefanski, winner of the December Mega Stack Challenge Main Event. After chopping this very event one year ago, Dave Stefanski has gone back-to-back in the December Mega Stack Challenge Main Event. For his victory, Stefanski takes home $52,359 as well as the Mega Stack Challenge Trophy. 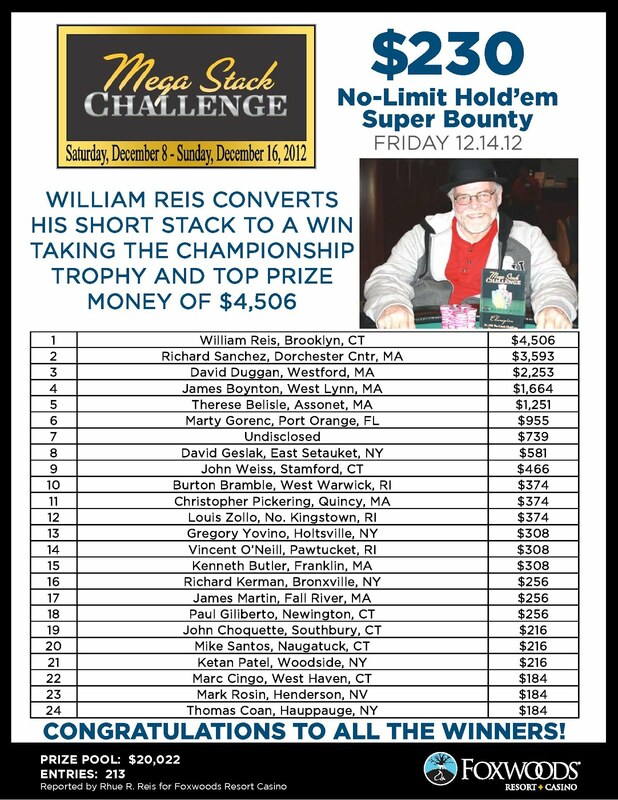 Thanks to everyone who play in the December Mega Stack Challenge and we will see you in February! Just lost to @davestefanski in a epic HU battle in the @foxwoodspoker main event. He played great, i guess today wasn't my day! #MaybePCA? 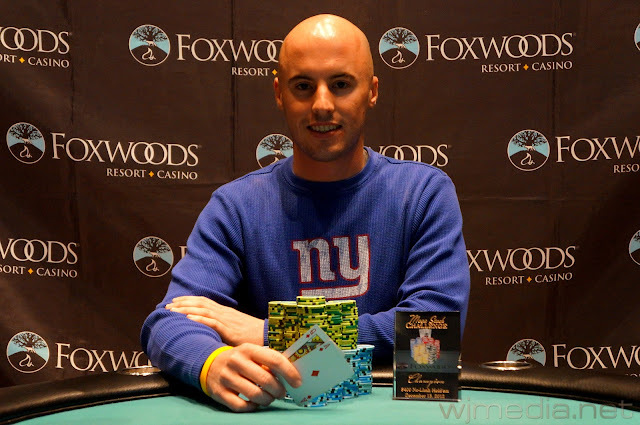 Once Tim Reilly and Dave Stefanski got heads-up in the Foxwoods Mega Stack Main Event, they decided to take $5,000 off of 1st place and add it to 2nd place. After that, the two engaged in a nearly three-hour heads-up battle with both trading the chip lead numerous times. Finally, they got all-in on a board of [Kc][Jd][7d] with Reilly holding [Kd][8s] for top pair against the [Ad][Qd] of Stefanski. The [9d] fell on the turn, giving Stefanski the flush and the victory. Tim Reilly officially finishes in second place and take home $40,448! Tim Reilly raises to 160,000 from the button and Jose Pena moves all-in. The board runs out [As][Jc][9h][7s][Jd] and Reilly doubles up with his pocket fives. 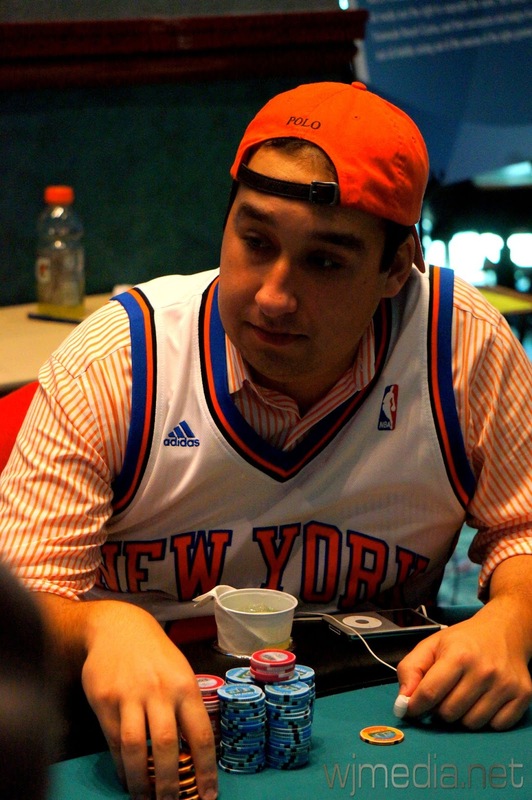 Pena is left with just 240,000 and is eliminated on the next hand by Reilly. Jose Pena takes home $25,811 for his 3rd place finish. Giuseppe Ruvolo raises to 575,000 before the flop from the button, leaving himself 20,000 behind. Dave Stefanski makes the call and the flop comes [9s][7s][5d]. Stefanski announces all-in and Ruvolo tosses his last 20,000 in the middle. The turn is the [9c] and the river comes the [Th]. Stefanski's threes hold up to win the pot. Giuseppe Ruvolo is eliminated in 4th place for $19,066. Re-Entry is Coming to the Foxwoods Poker Room in 2013! 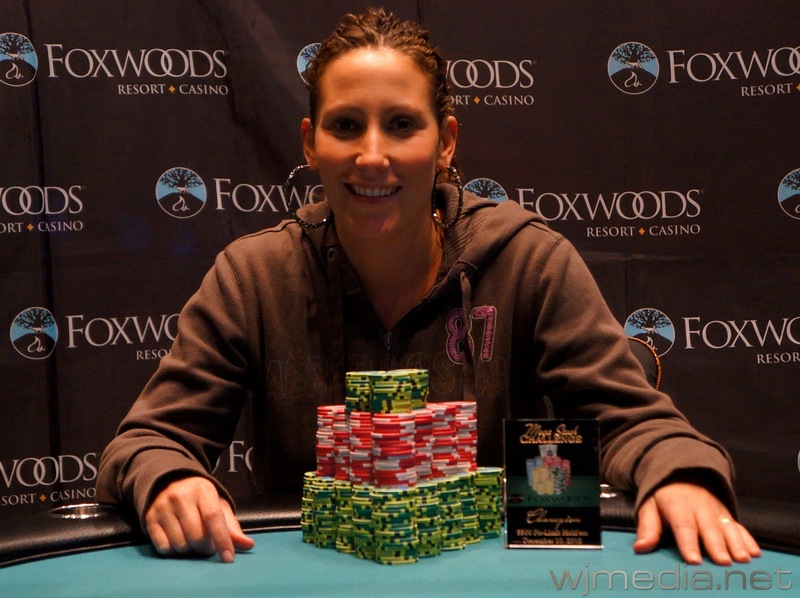 Starting in 2013, the tournaments at the Foxwoods Poker Room will feature Re-Entries for most events! 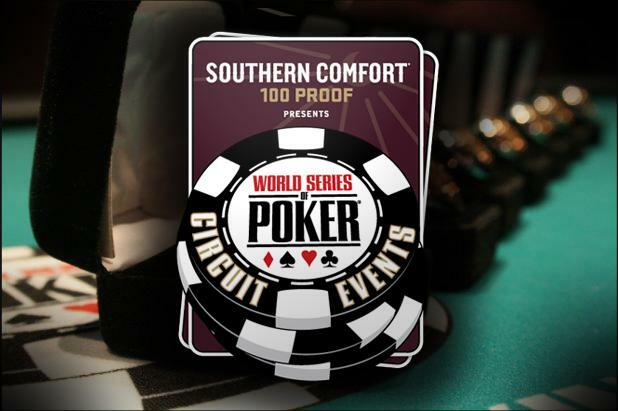 In addition, don't forget that the World Series of Poker Circuit makes a stop here at the end of March for 12 Circuit Ring events in 12 days! Ross Santos moves all-in for his last 555,000 from under the gun and is called by Dave Stefanski in the big blind. The board runs out [Ks][Td][2s][8c][Qh] and Stefanski takes the pot with a pair of tens. Ross Santos is eliminated in 5th place for $14,339. 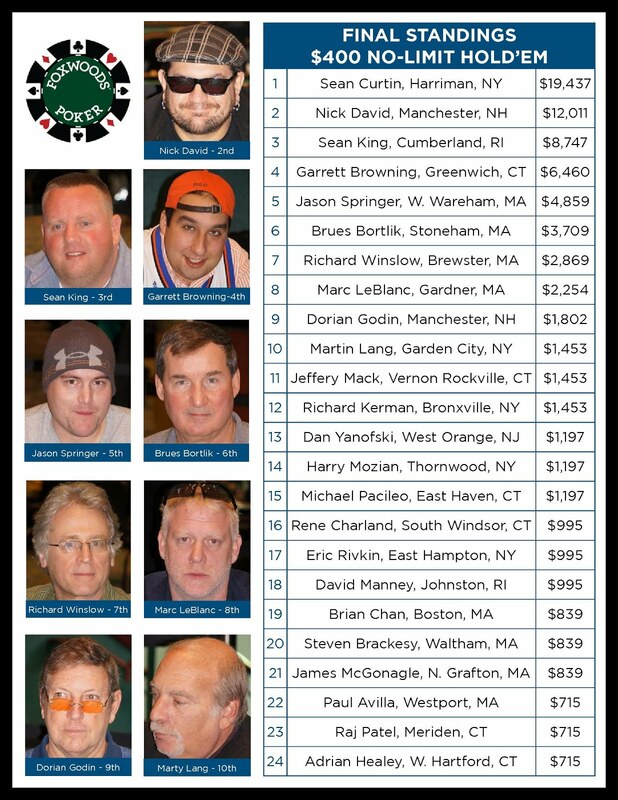 Tim Reilly limps from the small blind and Marty Lang raises to 160,000 from the big blind. Reilly makes the call and the flop comes [As][6c][2d]. Reilly checks and Lang fires 260,000. Reilly calls and the turn is the [7d]. Reilly checks again and Lang moves all-in, barely having Reilly covered. Reilly thinks for a few moments before announcing a call. Lang turns two pair to take a commanding lead in the hand. However, the [9h] falls on the river, giving Reilly a better two pair and a monster double up. Lang is left with only a few chips and would be eliminated on the next hand when his [9c][9d] could not catch up with Jose Pena's [Tc][Th]. Marty Lang is eliminated in 6th place and takes home $10,944. Tim Reilly opens before the flop to 75,000 and Henry Robinson three-bets to 225,000. Behind him, Jose Pena makes it 410,000. Reilly mucks and Robinson puts in a five-bet to one million straight. Pena moves all-in and Robinson calls. The board runs out [Td][Ts][5c][Qs][Kc] and Pena rivers Broadway to take a huge pot. Henry Robinson is eliminated in 7th place for $8,467. Dave Stefanski raises to 65,000 with the big blind at 30,000 and Marty Gorenc moves all-in for just over 500,000. Marty Lang then moves all-in and Stefanski folds. The board runs out [Tc][Th][2d][As][3c] and Lang pairs his ace on the turn to win the pot. Marty Gorenc is eliminated in 8th place for $6,653. The eight remaining players at the $1,200 Mega Stack Challenge Main Event are now on a one-hour dinner break. Play will resume at 7pm. 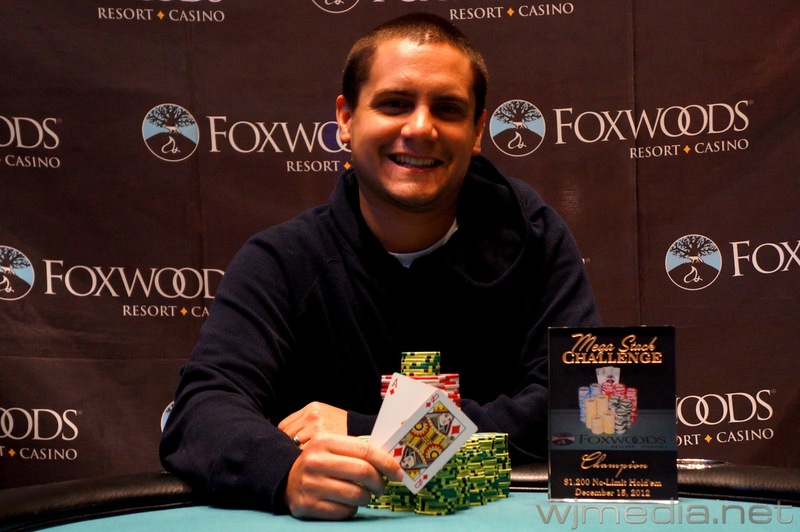 The flop comes [Jc][Th][5h] and Storella takes the lead with a pair of jacks. However, the [Kd] on the turn puts Ruvolo in the lead and the [2d] comes on the river. Ruvolo wins the pot, eliminating Storella in 9th place for $5,309. With only 13 players now remaining, Tim Reilly has taken the chip lead with nearly 1,500,000 in chips while the average is at 667,000. 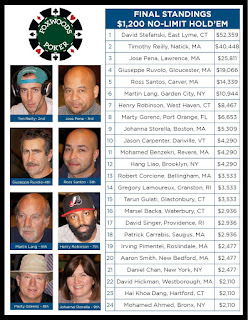 You can watch Tim in the Four Seat at the feature table by clicking on FoxwoodsLive.com. Mega Stack Challenge Main Event Now in the Money! 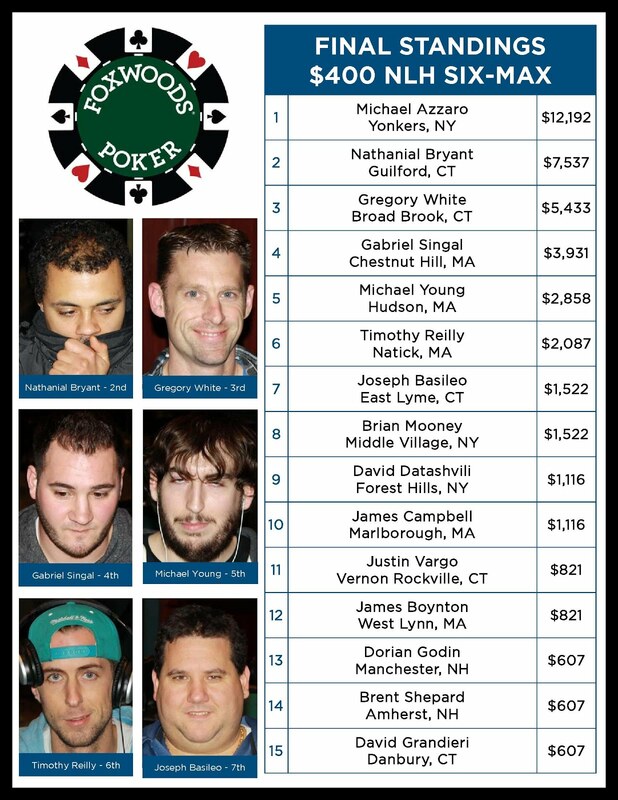 We are itm in the @foxwoodspoker main event. 24 left $58k for first. Still ave stack. Let the fireworks begin! 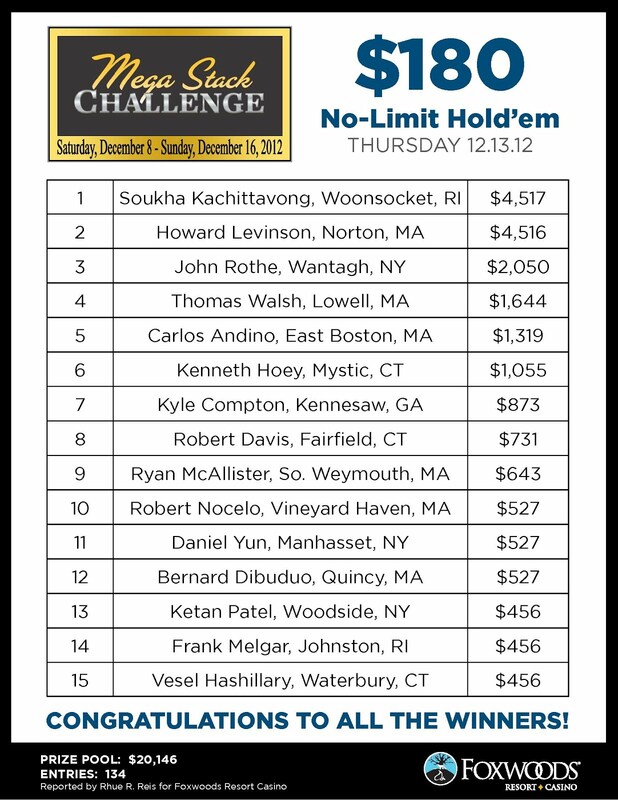 The money bubble has burst in the $1,200 No-Limit Hold 'em Mega Stack Challenge Main Event. All players are now guaranteed at least $2,110. Players have just redraw for seats at the final three tables of the $1,200 Mega Stack Challenge Main Event. With 27 players remaining, the average chip stack is now 312,000. The blinds are currently 5,000-10,000 with a 1,500 ante. 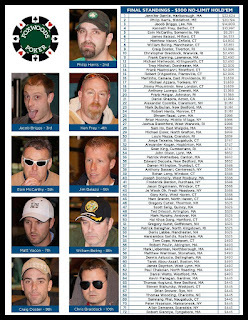 You can watch the feature table live at FoxwoodsLive.com. Day 2 of the $1,200 No-Limit Hold 'em Mega Stack Challenge Main Event is now underway. The blinds are now 3,000-6,000 with a 500 ante. Play has come to an end on Day 1 of the $1,200 No-Limit Hold 'em Mega Stack Challenge Main Event. There are 43 players remaining and the average chip stack is now 202,000. The blinds will be starting tomorrow at 3,000-6,000 with a 500 ante. Day 2 will get underway at 11am tomorrow. End of Day 1 chip counts and Day 2 seat assignments will be posted shortly. Players have returned from break and cards are back in the air. The blinds have been increased 2.500-5,000 with a 500 ante. With 57 players remaining, the average chip stack is now 152,000. This will be the final level of play on Day 1. Day 2 will resume at 11am tomorrow. 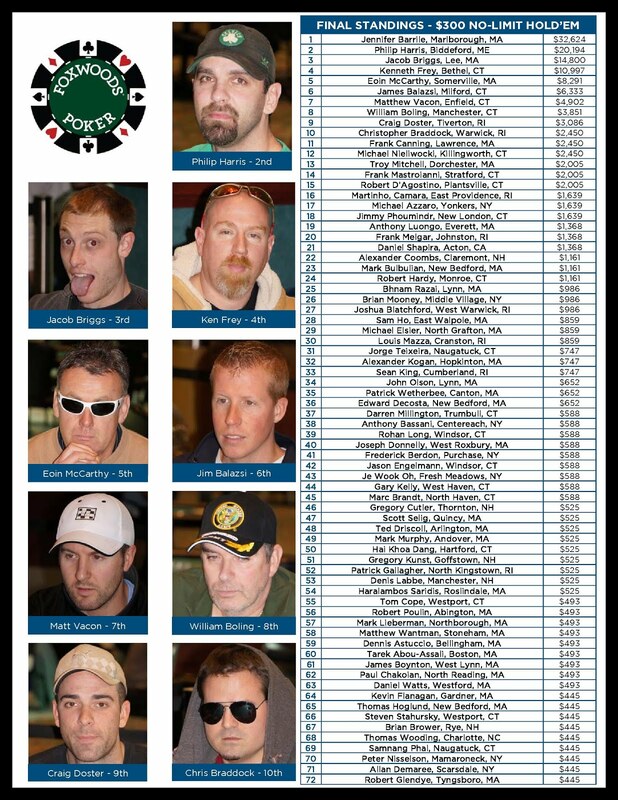 We are down to 98 players in the $1,200 No-Limit Hold 'em Mega Stack Challenge Main Event. The blinds are currently 1,000-2,000 with a 300 ante and the average chip stack is now 88,500. Play will continue on Day 1 until approximately 1am. All players will then bag their chips and play will resume tomorrow at 11am and play down to a champion. 217 entrants. $57k 1st. Moved to feature table. Couple big stacks to my left. That's it for now. 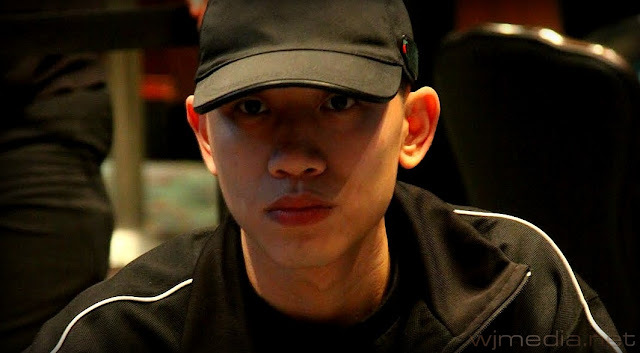 Daniel Chan, who won the $1,100 Super Bounty in October for $16,790 as well as the May Mega Stack Challenge Main Event for $81,611, is now in Seat Two at the Live Stream Feature Table. Chan currently sits on 152,000 with the average only at 72,000 with 120 players remaining. You can watch now by clicking on FoxwoodsLive.com. 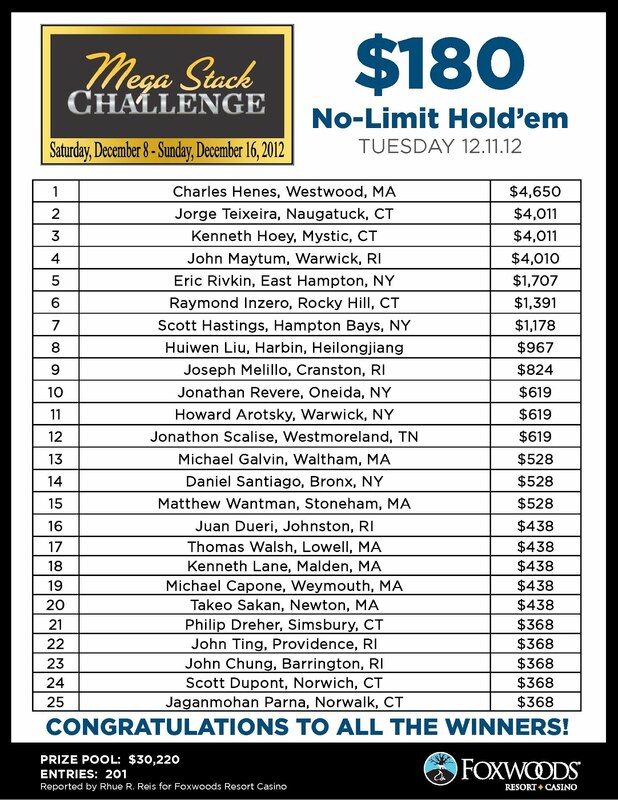 There are now 153 players remaining in the Foxwoods Mega Stack Challenge Main Event. The players are currently on break. When play resumes, the blinds will be increased to 500-1,000 with a 100 ante. The average chip stack is currently 56,700. Just before the break, Tim Fiorvanti was eliminated when he ran pocket eights into his opponent's pocket queens on a flop of A-Q-8. 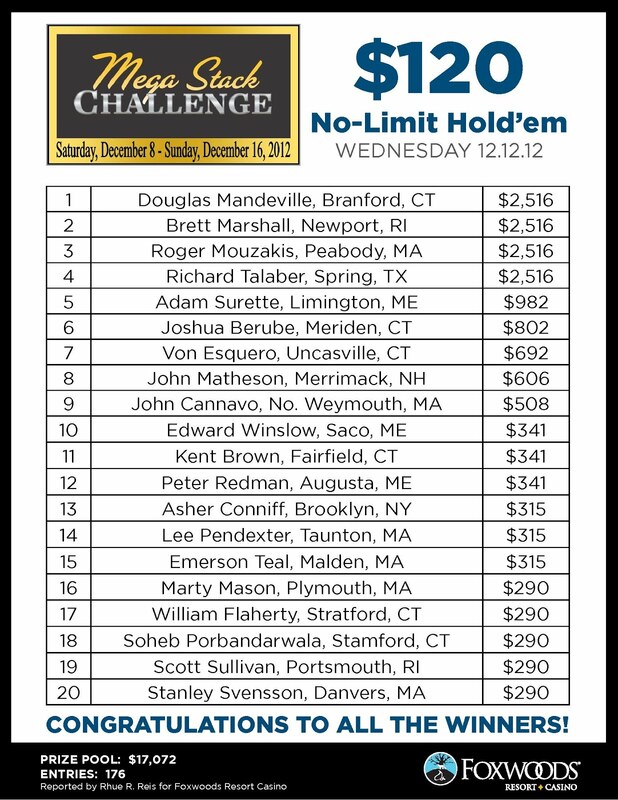 We had a total of 217 players in today's $1,200 No-Limit Hold 'em Main Event at the Foxwoods Mega Stack Challenge. The final 24 spots will finish in the money. There are currently 197 players remaining with the blinds at 200-400 with a 50 ante. James Campbell raises to 650 before the flop and is called by Nick Palma, in the small blind, as well as the big blind. The flop comes 7-5-4 with two clubs and it is checked to Campbell, who fires 1,150. Palma raises to 9,000 and the big blind folds. Campbell moves all-in for a total of 25,500 and is called by Palma. Campbell shows pocket sevens for top set while Palma turns up [Kc][6c] for a flush draw and an open ended straight draw. The turn is a blank deuce but the river is the [Jc], giving the Palma the flush. 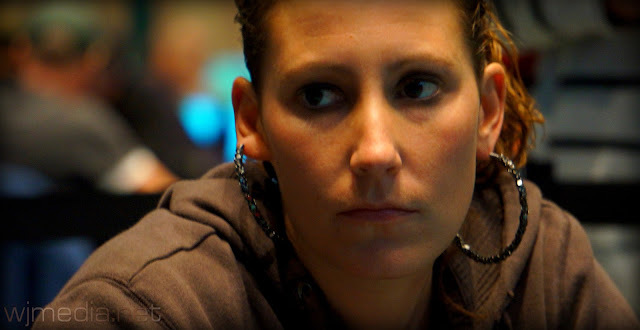 Campbell is eliminated early on Day 1 of the Main Event. Among those in the field for Day 1 of the $1,200 No-Limit Hold 'em Mega Stack Challenge is none other than Tim Fiorvanti. Tim is a writer and poker tournament reporter for BLUFF Magazine but is on the other side of the felt today. Early on, Tim has already built his stack up to near 50,000 from his 40,000 starting stack. $1,200 Mega Stack Challenge Main Event is Underway! 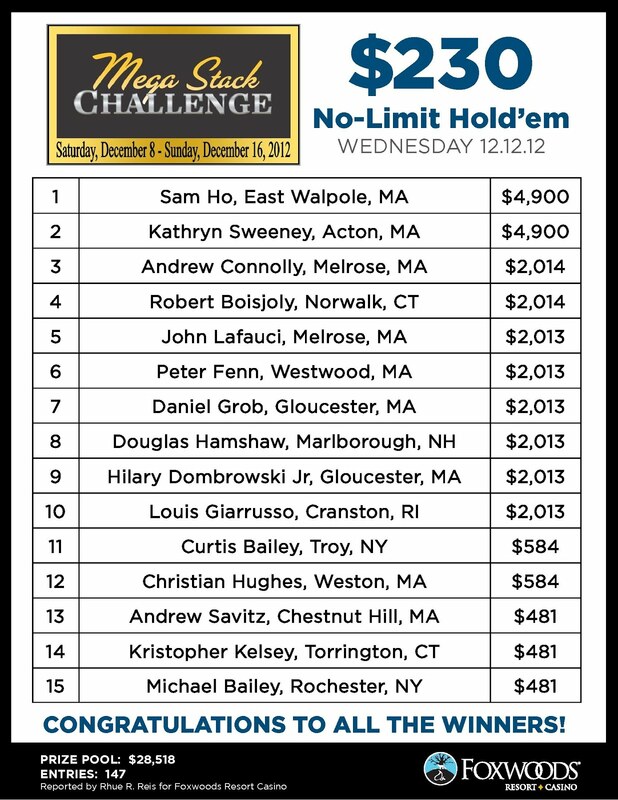 The $1,200 buy-in No-Limit Hold 'em Foxwoods Mega Stack Challenge Main Event is now underway! Players start with 40,000 in chips and the blinds are currently 50-100. Levels 1-16 are 40 minutes in length while Level 17 and on will be 50 minutes in length. Registration will remain open for the first four levels of play. Sean Curtin, winner of the $400 Mega Stack Challenge! Congratulations Sean Curtin, champion of the $400 No-Limit Hold 'em Mega Stack Challenge event. For his victory, Sean takes home $19,437 as well as the Mega Stack Challenge Trophy! 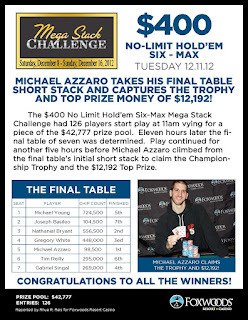 Be sure to join us tomorrow at 11am for the start of the $1,200 No-Limit Hold 'em Mega Stack Challenge Main Event! Nick David moves all-in from the button for less than one million chips and is called by Sean Curtin. The board runs out [7c][7d][5s][5d][3d] and Curtin wins the pot with his ace high kicker. Nick David is eliminated in 2nd place and takes home $12,011. Sean Curtin raises to 125,000 from the button and Sean King moves all-in for just under one million chips. The board runs out [Qs][Jd][9d][Ad][5h] and Curtin wins the pot with a pair of queens. Sean King is eliminated in 3rd place for $8,747. Sean Curtin limps from the button for 30,000 as does Sean King from the small blind. Garrett Browning raises 125,000 more and Curtin calls. King calls as well. The flop comes [8d][8s][7c] and King moves all-in for 790,000. Browning, who also has exactly 790,000, calls and Curtin folds. The turn is the [Td] and the river comes the [3c]. The pocket fours of King hold up to win the pot. Garrett Browning is eliminated in 4th pace for $6,460. The board comes [Ac][Kc][6d][Kh][9s] and Browning improves to a full house. Jason Springer is eliminated in 5th place for $4,859. A short stacked Brues Bortlik moves all-in and is called by Sean Curtin. The board runs out [Kh][6h][5c][8d][4s] and Curtin wins the pot with his pocket jacks. Brues Bortlik is eliminated in 6th place for $3,709. Winslow is in great shape to double up until the board comes [7s][6d][5h][Jc][4h]. King makes trip sixes to win the pot. Richard Winslow is eliminated in 7th place for $2,869. 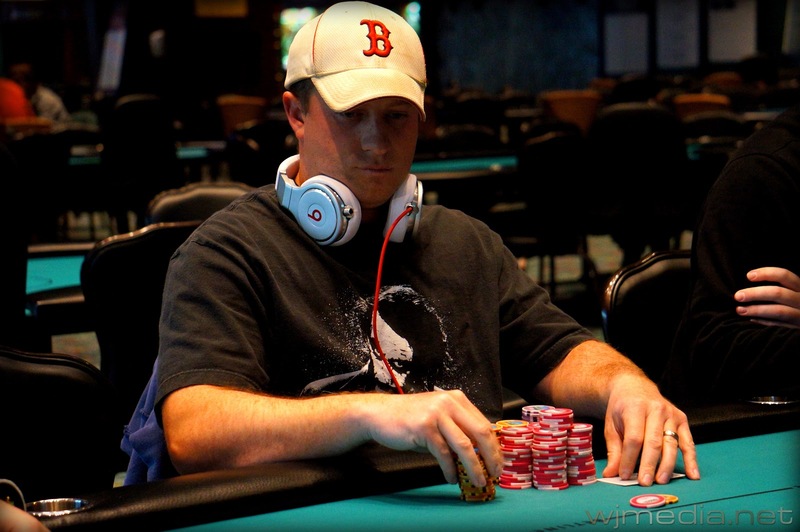 After a raise by Jason Springer, Marc LeBlanc moves all-in. Behind him, Nick David moves all-in for an additional 243,000. It is folded back around to Springer, who folds [Kh][Qd] face up. The board runs out [Ac][Jh][8h][Qs][5c] and David takes the pot with his trip jacks. Marc LeBlanc is eliminated in 8th place, taking home $2,254. On a flop of [Qc][9d][2d], Dorian Godin gets all of his chips in the middle against Jason Springer, who has him just covered. The turn is the [4d] and the river comes the [Tc]. Springer wins the pot with his pocket aces. Dorian Godin is eliminated in 9th place for $1,802. The board runs out [Kc][Qd][2h][7s][6s] and Godin improves to two pair to win the pot. Marty Lang is eliminated in 10th place for $1,453. We have reached the final table of the $400 No-Limit Hold 'em Mega Stack Challenge event. The blinds are currently 8,000-16,000 with a 2,000 ante. 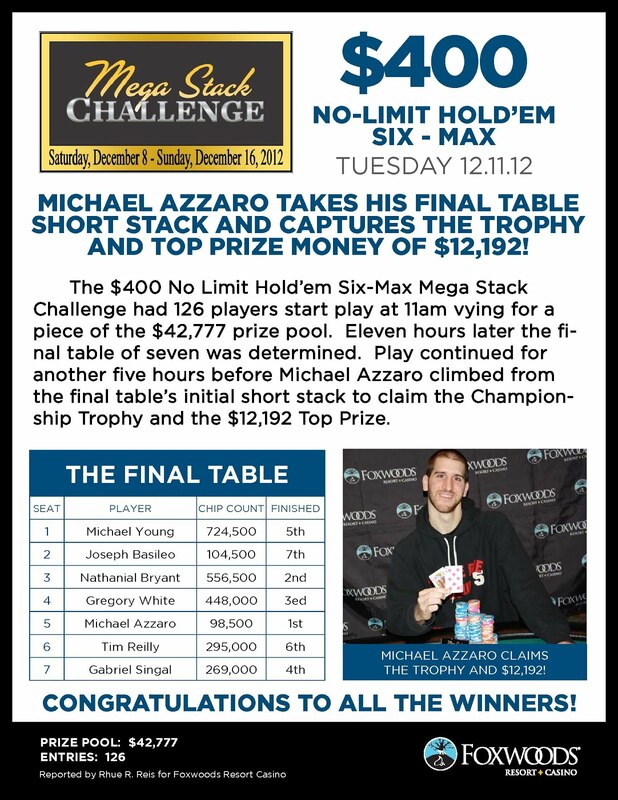 Play has come to an end on Day 1 of the $400 No-Limit Hold 'em Mega Stack Challenge event. 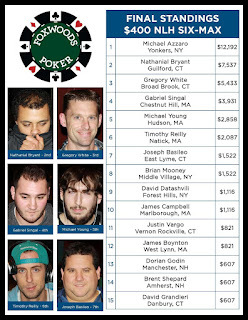 There are 11 players remaining with the average chip stack now at 416,000. Play will resume at noon tomorrow with the blinds at 8,000-16,000 with a 2,000 ante. $400 No-Limit Mega Stack Challenge Now in the Money! We are down to the final 24 players in the $400 No-Limit Hold 'em Mega Stack Challenge. All players are now in the money and guaranteed at least $715. The blinds are now 3,000-6,000 with a 500 ante and the average chip stack is 191,000. We had a total of 229 players in today's $400 No-Limit Hold 'em at the Foxwoods Mega Stack Challenge. The final 24 spots will finish in the money. There are currently 200 players remaining with the blinds at 150-300 with a 25 ante. Cards are in air for the $400 No-Limit Hold 'em event at the Foxwoods Mega Stack Challenge. All players start with 20,000 in chips and the first 12 levels are 30 minutes in length. All levels after that are 40 minutes. This event features a $75,000 Guaranteed prize pool. Jennifer Barrile, winner of the $300 No-Limit Hold 'em event. 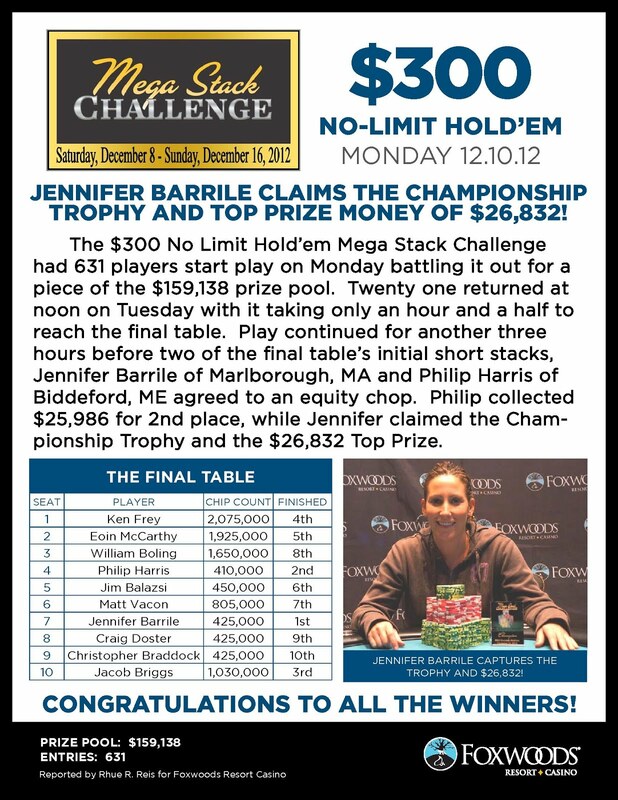 After the equity chop, Jennifer Barrile is officially the champion of the $300 No-Limit Hold 'em Mega Stack Challenge event. 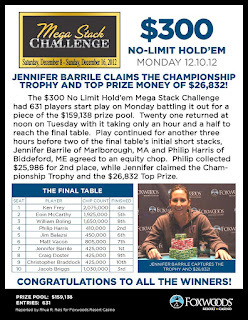 Jennifer takes home $26,832 as well as the Mega Stack Challenge Trophy. The final two players in the $300 No-Limit Hold 'em Mega Stack Challenge have come to an agreement on a chip equity chop. After the deal, Phil Harris officially takes 2nd place as well as $25,986. A short-stacked Jacob Briggs moves all-in from the small blind from less than one million chips and is called by Phil Harris in the big blind. The board comes [9h][3d][2d][7h][Js] and Harris takes the pot. Jacob Briggs is eliminated in 3rd place for $14,800.